“Icons” should be able to have custom size like images not only preset sizes. “HTML widget” should have ability to get aligned. @ac.afd Thanks for the feedback, however, most of this can already be done in Blocs. Good idea but tricky, they would need to stack up as they scroll down so it gets fiddly if you use more than one and the user is on mobile. You can do this already, checkout the latest beta. Carousels now have an area to drop Brics into. 3.“Icons” should be able to have custom size like images not only preset sizes. You can create submenus and point them to any pages in Menu Manager. 11.“HTML widget” should have ability to get aligned. Not sure what you mean here, there is no limit on the text inputs in the page settings. Just a quick suggestion on point 12 regarding SEO. How about a discreet character count as you are typing. A bit like you see in the attachment in red. 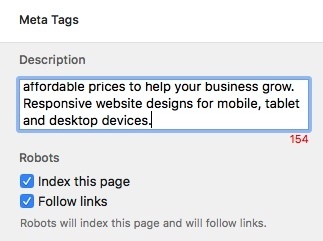 That is used to indicate when you are getting close to a limit, the SEO fields don’t have a limit so it would just be extra clutter that’s not essential. I thought this figure was more based on what is shown in the search results and considered optimal, though admittedly this is a moving target. That’s understandable…you did give Sunday tech support last week… Have a great weekend OFF. I find I need three industrial sized coffees just to realise it’s Friday. @Norm, Thanks for your reply. I understand that most of the above mentioned things can be done through “CUSTOM CLASS” but it takes lot of time and effort. It’s a suggestion that if you can implement these thing within the Option/Right-side panel it would be great for beginners! I’ve also added “14.” and “15.” point check if that can be implemented. I would like social share buttons, like Tweet button. @ac.afd the problem with trying to add more to the sidebar defeats the point of it, the sidebar is by nature supposed to be the bare essentials, the basics. It’s appeal right now is that it’s easy to understand, the more that is added to this area the more complex it will become and ultimatly the sidebar would just end up looking like the class editor which right now is more work to use in your opinion. Getting the right balance is hard work, but it’s not impossible. That said Blocs will only ever do the basics in the sidebar, the class manager and editor offer vastly superior control of objects in a site and are well worth learning, they are basically like layer styles if you come from a graphic design world. @Ben I was just about to say that Blocs already has social sharing options, but I see what you mean now. You can only navigate to your own social feed rather than allowing visitors to share what they found directly from your page. 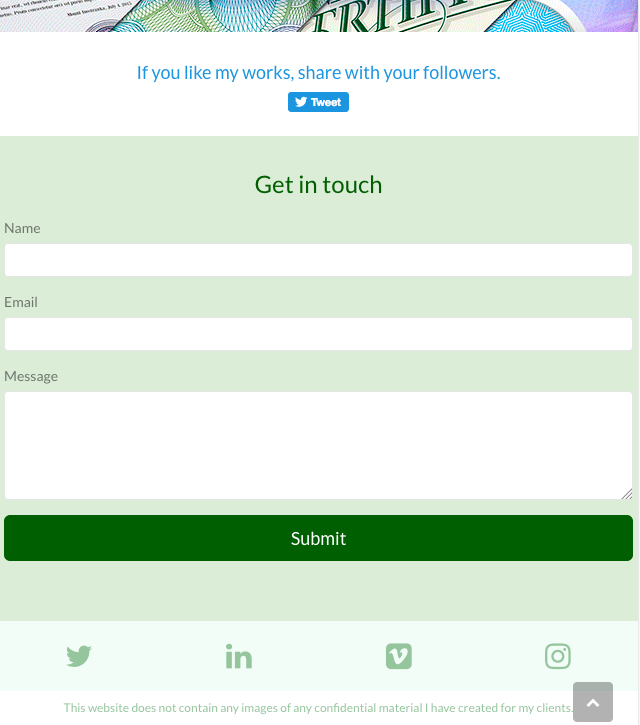 I assume this can be done by some other means, inserting code from sites like Facebook, however it would be nice if this could be done with the existing Blocs and simply have a sharing option added in the side panel when you click on the image icon and define the interaction. It would be great to improve the asset manager: being able to re-arrange assets and add custom groups/tabs for assets. I am dealing with a 100+ product images website that needs updating frequently. Navigating the asset manager and finding the right image becomes very difficult. @Flashman Thanks, but I think it is two different things. Currently I’m using a social links. I would like the premade social share buttons. Social links, only link my social activity. Social share button is share things with your followers. I’m only designer, not a programmer. Could you explain me what code do I need? I appreciate it the bloc sample file. Yes I agree with you, but I thought we could also have the option of using built in icons for this purpose. The Blocs icons through font awesome etc are actually quite nice. Yes I agree with you, but I thought we could also have the option of using built in icons for this purpose. Yes, but we need a code. Like the “Tweet” button. It should be distinguished from the icons. Which is only link, and what is the share. Bird icon = link, Tweet icon = share. P icon link to Pintereset. “Pin it” icon share on Pinterest… This is a standard. I wanted a further option added to the interactions section, so that when you click on an icon e.g Twitter, or indeed any image, it provides the opportunity to share without coding. Yes. This is a two different method. Link is a simple thing. This attachment shows a setup I have for a stack in Rapidweaver aimed at sharing. You simply select the social network you want and go with share mode. It writes all the code automatically. 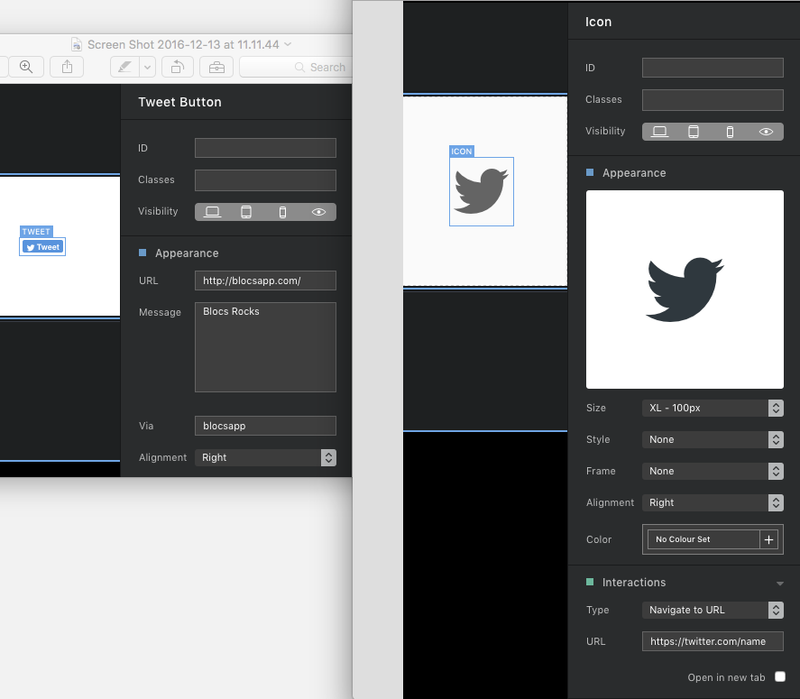 A simplified version could be created for Blocs and probably within the existing interactions section. It would be nice like this or similar.